Arsenal had to work hard for victory at Meadow Park. Arsenal made it seven wins from seven in the WSL as they defeated Birmingham 3-1 at Meadow Park. Two goals from Jordan Nobbs and a penalty from Danielle van de Donk ensured the Gunners maintained their 100% start to the season. However, it didn't come easy for the London side who were made to work hard for all three points after Emma Follis' equaliser on the hour mark. Arsenal have been starting games by flying out of the traps in the WSL this season but they found life difficult against a stern Birmingham side. The Blues came into this weekend's rounds of fixtures in third and showed why with a well organised first-half display. Although Katie McCabe fashioned a chance in the opening minutes, the Gunners struggled to create anything of note in a first half lacking the quality we've become accustomed to of Joe Montemurro's team this term. Birmingham enjoyed their fair share of possession and if it wasn't for a fantastic block from left-back Emma Mitchell, Arsenal may have found themselves behind on 20 minutes as she tracked back brilliantly to block Charlie Welling's shot. However, Arsenal grew into the game and after 30 minutes began to find their groove. Nobbs has been in the goals but she saw her shot from the edge of the box on the half-hour mark tipped wide of the post by Ann-Katrin Berger. Beth Mead proved lively at the start of the second period, creating a chance for Nobbs who could only find the goalkeeper before the former also saw a shot saved. The game came to life around the hour mark as there were two goals in as many minutes. Nobbs capitalised on an open Blues backline and received a pass from Mead before putting Arsenal in front. However, there was an instant response from Birmingham as Follis got down the right and then fired home to make the scores level, beating Pauline Peyraud-Magnin at her near post. Arsenal stepped up their intensity once more and it wasn't long before they were back in front. Lisa Evans was pulled down inside the area by Aoife Mannion which resulted in a penalty being awarded. Van de Donk stepped up and calmly found the back of the net. What preceded was a scrappy final twenty minutes in Borehamwood but Nobbs found her second of the game in injury time, getting on the end of a pull back to secure the win. The injury to Kim Little against Chelsea was always going to be bad news for Arsenal and it was especially evident against Birmingham with the Gunners initially missing a creative spark in the first half. Arsenal have been rampant in the WSL, scoring a total of 31 goals in just six matches going into the day's game but they weren't their usual free-flowing selves on Sunday afternoon. Birmingham closed down the spaces well and made life difficult for the north London side who have so far been untested until now. It showed that Montemurro's team may not have it all their own way this season but the Gunners were able to display a different side to their game. Everything has been pretty about their play this term but against the Blues they had to show steel and courage to come through the game. It was a testament to the away side that they were able to restrict Arsenal so well throughout the 90 minutes. The Blues had four wins from their opening six matches before their trip to Meadow Park and had conceded just three goals in that time. It was a statistic that showed against the Gunners who for much of the game couldn't break down the well organised back line of Birmingham. Not many teams have stopped Vivianne Miedema this season but the Blues did exactly that. They will be disappointed not to have taken something from the game, especially after their quick response to Arsenal's opener but they can take the positives from once again challenging one of the best outfits in the WSL. Much of Arsenal's male side’s displays this season have relied heavily on the performance of defensive midfield Lucas Torreira. Doing a similar job for the women has been Swiss midfielder Lia Walti. She has been brilliant for Arsenal this season and has shone out in a side that have usually been all about attack. 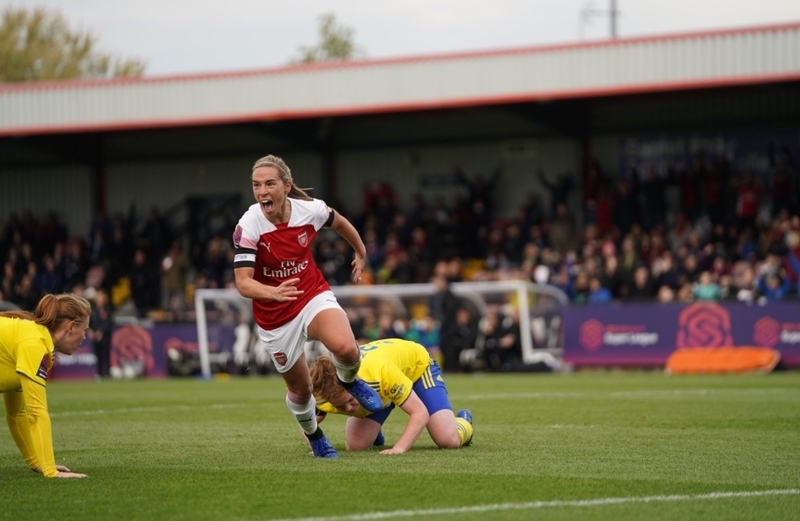 Against Birmingham Walti was again influential and it was only after she pushed on in the first half that the Gunners started to look more comfortable. She was all over the pitch as she put in a faultless display in front of the defensive line. Nobbs was also vital for Arsenal, as she continued her terrific early season form by scoring her seventh and eighth goals of the campaign.